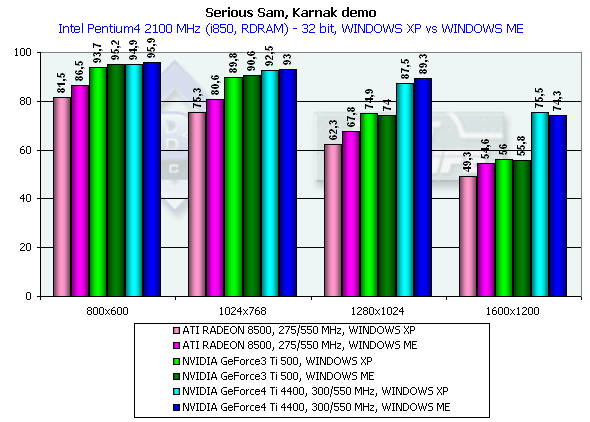 The diagrams show both average and lowest performance results. 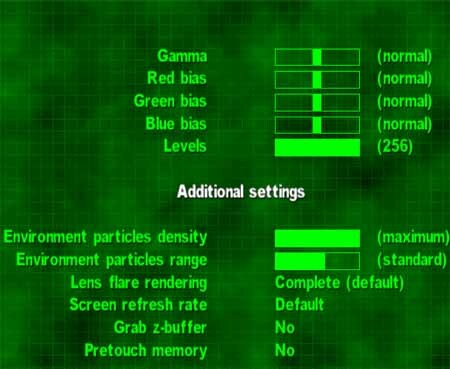 The performance drop, when moving from 16 to 32-bit mode, showed that the time of 16-bit color has passed. All accelerators provide good playability even in 1600x1200x32. 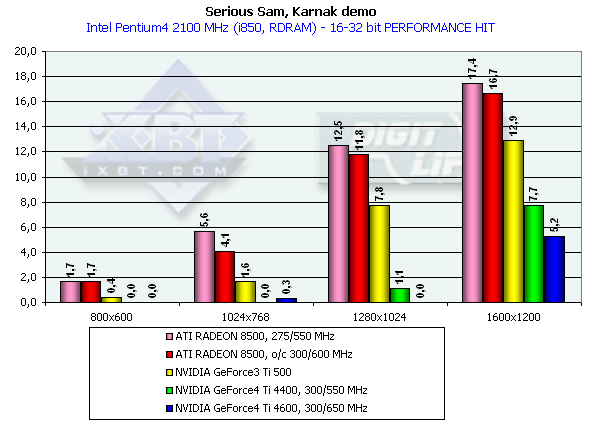 In 1600x1200x32 the GeForce3 Ti 500 falls behind the GeForce4 Ti 4400 by 34.8%, and behind the GeForce4 Ti 4600 by 39.3%. 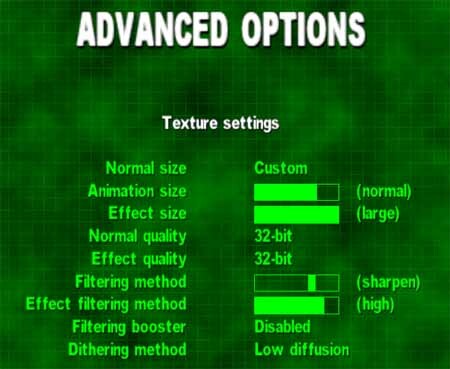 The tests were carried out in 32-bit color at the highest detail and quality levels of textures. 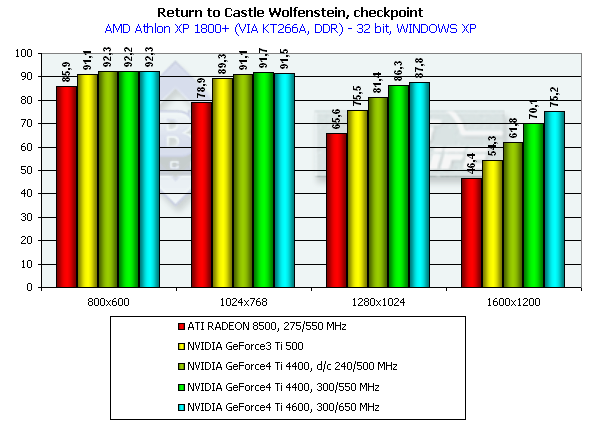 Although this game is more GPU and CPU dependent the competitors take the same places. Again we can see that the OpenGL ICD works excellently under the Windows XP. 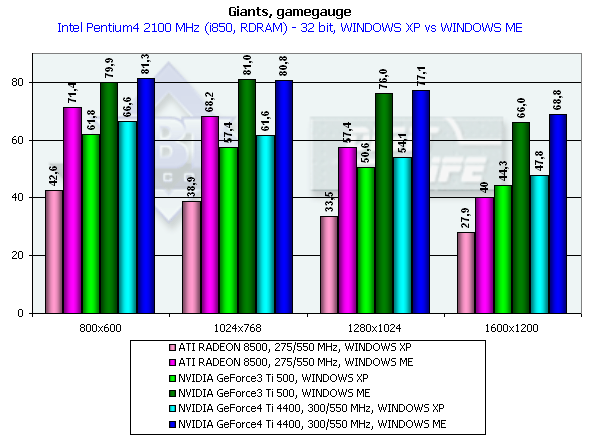 The NVIDIA based cards have better results in the Windows XP than in the Windows ME. 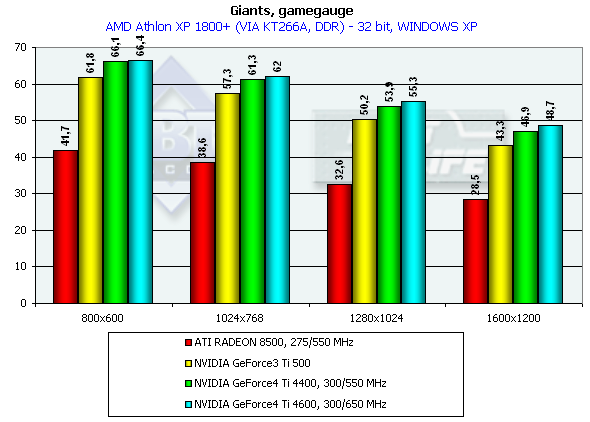 In 1600x1200x32 the GeForce4 Ti 4400 beats the Ti 500 by 25.6%, and the GeForce4 Ti 4600 outscores it by 34.6%, which are very good results for the GPU whose frequency is higher by 25%. As you can see, the memory bandwidth is of vital importance here. 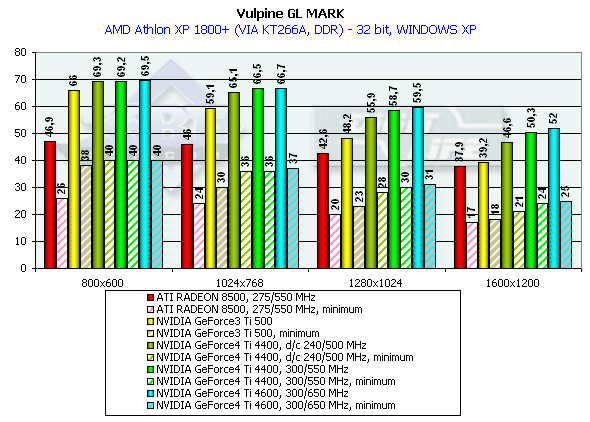 We think that this game excellently shows power and capabilities of modern video cards when geometry is very complicated as compared with other benchmarks for DX (the game shows relief texturing technique based on the Dot3 and environment mapping which requires a high fillrate from the accelerators). 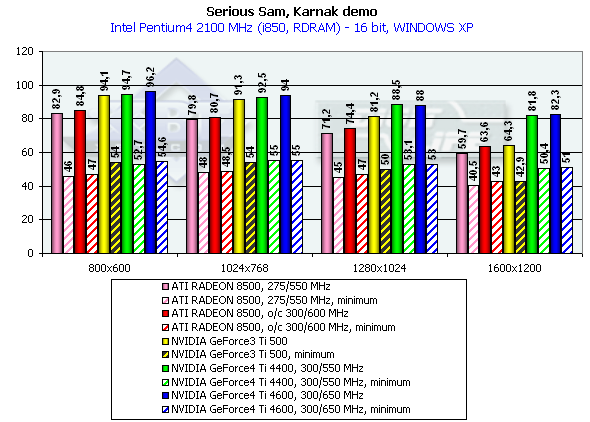 The disadvantage of this test is dependence on a CPU frequency and on a platform. 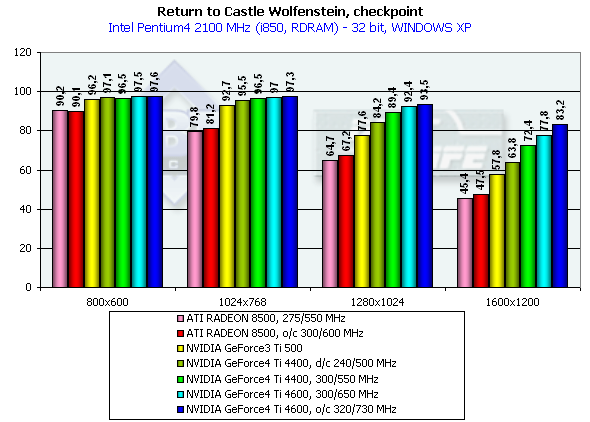 The performance gain is not so striking this time. 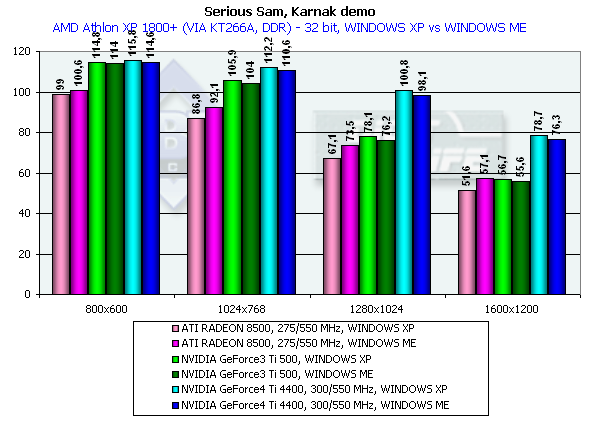 Look how better the performance is under the Windows ME than under the Windows XP. It is obviously not the drivers but the game which was adjusted for this OS. 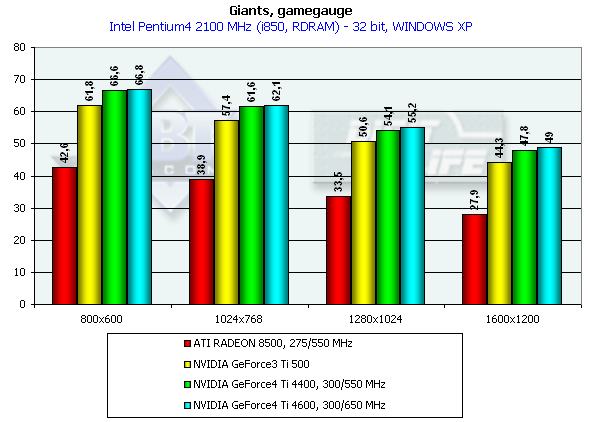 The Ti 500 loses to the GeForce4 Ti 4400 by 7.9%, and to the GeForce4 Ti 4600 by 10.6% (in 1600x1200x32). 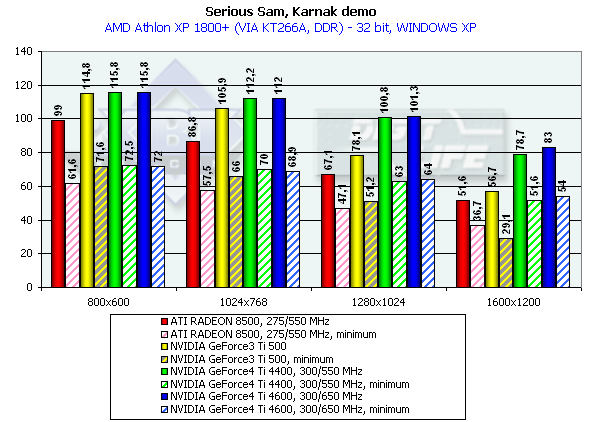 Keep in mind that it is the Windows XP which demonstrates a lower performance. 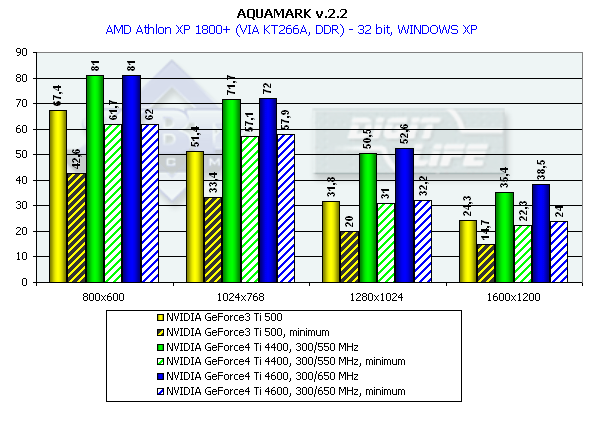 Besides, the engine of the game hardly reacts on power growth of a video card. Probably, it is CPU dependence which is guilty. 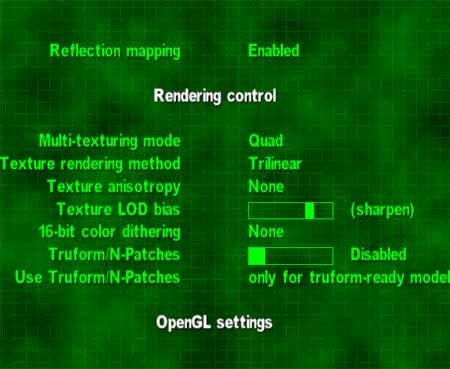 GLMark uses extensions of OpenGL from NVIDIA typical of the GeForce3, that is why it is interesting to compare GeForce3 and GeForce4 in this test, though the results of the ATI RADEON 8500 are also shown (but remember that this card is not able to use some bump mapping functions peculiar to the GeForce3 and some NVIDIA extentions for acceleration of GeForce3/4 cards. 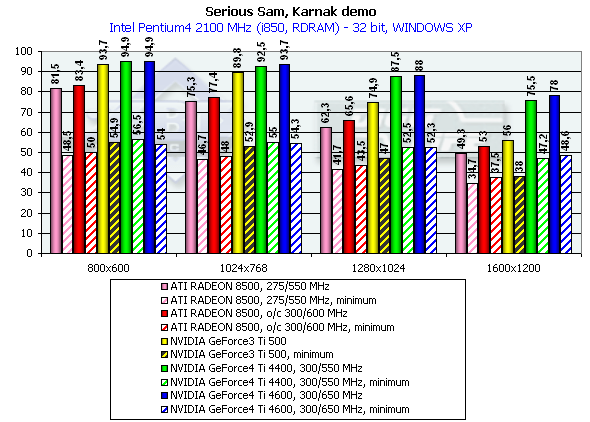 The cards were tested only in 32-bit color. This is a very complicated test (considering the number of polygons and effects of relief texturing). 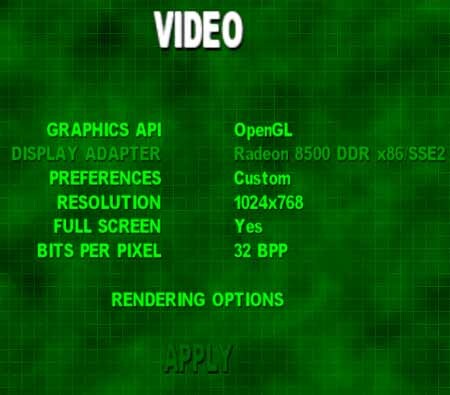 Only in 1280x1024x32 the GeForce4 allows playing comfortably. 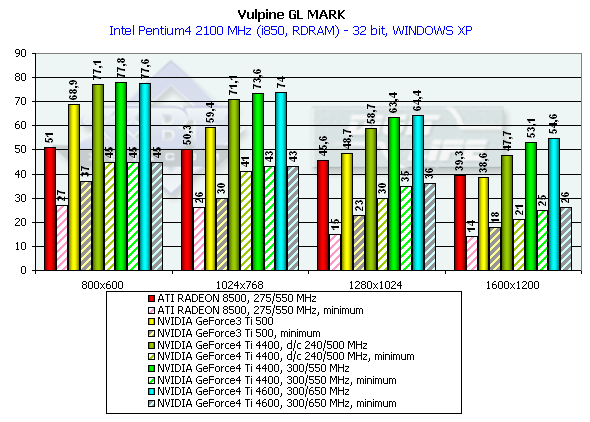 The Ti 500 yields to the GeForce4 Ti 4400 by 37.5%, and to the GeForce4 Ti 4600 by 41.5%. 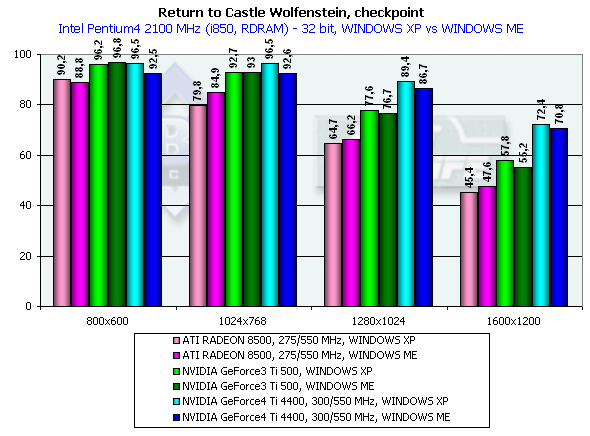 The test of the GeForce4 at the Ti 500's frequency of 240/500 MHz showed once again that the architecture of the new GPU is much improved. 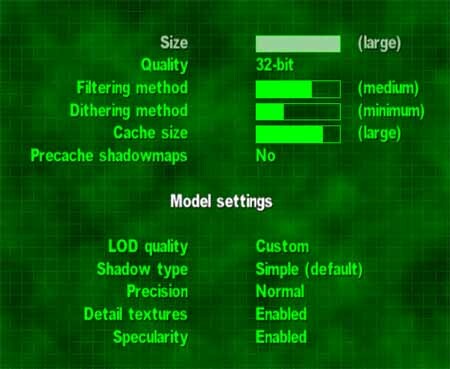 The test uses a set of textures of 24 MBytes, pixel shaders are enabled, and the cards were tested only in 32-bit color. 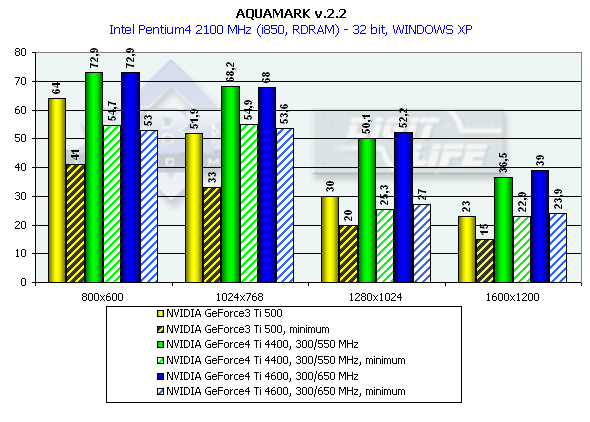 Almost a year ago the the AquaMark benchmark was created on the base of the AquaNox game. Scene complexity in the AquaMark was almost 130,000 polygons. However, the GeForce4 easily copes with it. 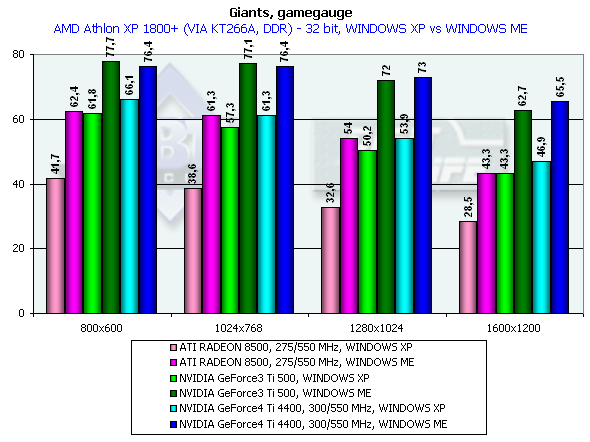 In 1600x1200x32 the Ti 500 loses to the GeForce4 Ti 4400 by 58.7%, to the GeForce4 Ti 4600 by 69.5% ! 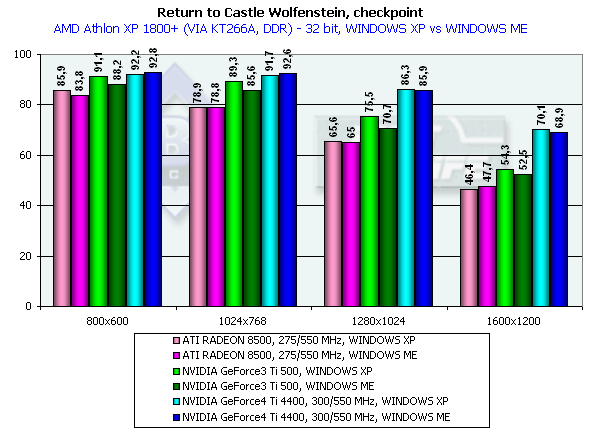 It is interesting that this test makes strong demands to a GPU instead of the memory bandwidth. The difference between the 4400 and 4600 models is minimal.